Includes individual adjustment of string position for jazz, classical, rockabilly etc. 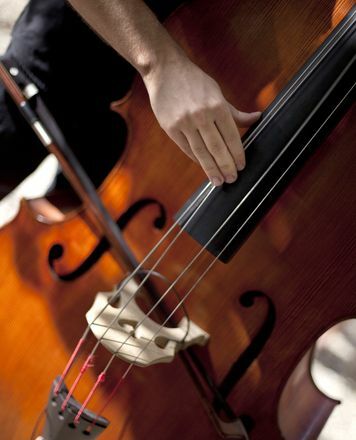 All acoustic double basses are individually adjusted and tuned in our workshop for your desired playing situation/style (jazz, classical, rockabilly...). When ordering online, please use the text field "Comment" to indicate the desired string position. If you order this product together with others as part of a bundle, you can save up to 5 % additionally! 91 customers have given this product a 5-star rating. Of these, 76 customers have written no texts or given their feedback in another language. 79 customers have given this product a 4-star rating. Of these, 72 customers have written no texts or given their feedback in another language. 21 customers have given this product a 3-star rating. Of these, 20 customers have written no texts or given their feedback in another language. 8 customers have given this product a 2-star rating. Of these, 7 customers have written no texts or given their feedback in another language. 6 customers have given this product a one-star rating. Of these, 5 customers have written no texts or given their feedback in another language. I ordered and received my bass back in September, and love it just as much now as did when I received it. When the bass arrived (stood up on a pallet), it was very well packed and very secure. After getting past all the packaging I inspected the bass and it was perfect. The bridge is shipped loose in the box, and (very helpfully) had "E" and "G" on the respective sides. On the body of the bass there was two small marks to show where the bridge sits. Bridge in place, it was time to tune up and have some fun. Tuning up was nice and simple and compared to a previous bass, tuning wasn't that scary. There was no creaking and popping, just a very smooth tune up. As mentioned, the screw to hold the endpin isn't the greatest, but mine seems to have settled in a small groove made in the endpin and works fine now. The sound quality of the instrument straight out of the box is good, the first thing I did however, was change the strings. The stock strings are high tension and not too great. With the intention of playing jazz and rockabilly styles, I've opted for low tension Rotosound strings (half steel, half nylon) and with these strings on the bass just sings. More recently I've started using the bow more and more often and whilst the bow is pretty good, I'm not too keen with a German style frog (perhaps having an option to pick could help? ), so I've just ordered myself a French style (pernambuco) bow. Before ordering my bass I looked online for advise and lots of people suggest avoiding new basses, especially if they're under £1000. With this it doesn't matter, for the money it's a great bass and I love mine. Good value first time double bass! Like many others on here, I bought this as my first double bass. I?ve been playing electric bass for many years and always fancied one of these. I live in the Canary Islands Spain, so it was never going to be cheap to get it posted here so it was a bit of a gamble to say the least. When it finally arrived (postage took a lot longer than I?d thought, 1 month. That was mainly due to Spanish couriers - no surprise there then) the bass was packed very well and set on a pallet. Once unpacked the only thing I had to do was get a local luthier to set it up properly, the action was super high and virtually unplayable. You may also want to change the strings as they are pretty high tension. Overall though, a super looking bass for the money and its also sounds great once set up! For playing live I also thoroughly recommend the David Gage The Realist Bass Copperhead pickup. ID: 165069 © 1996–2019 Thomann GmbH Thomann loves you, because you rock!